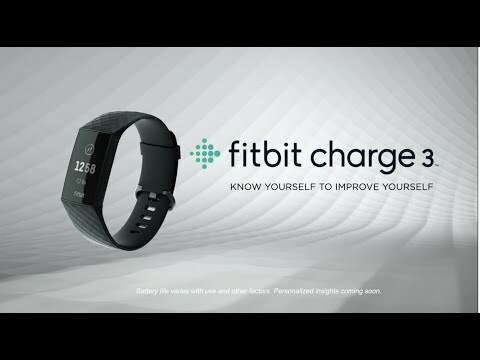 the better you know yourself, the better you can be!The Fitbit Charge 3 in Black is a touchscreen fitness wristband made with durable Graphite aluminium detailing and comes with small and large sizes. Get active with Fitbit Charge 3, the intelligent health and fitness tracker overflowing with many innovative features to improve your understanding of your own health and body. This smart wireless health band uses 24/7 heart rate and personalised data to keep you updated with real-time notifications to reveal what’s below the surface. Fitbit Charge 3 Fitness Activity Tracker, Black/Graphite, Water Resistant, 24/7 Heart Rate is rated 5.0 out of 5 by 2. Rated 5 out of 5 by Spudsmum1 from The product does what it says on the tin The product is just what I needed to keep an eye on my heart rate and also sleep patterns. There are other features too which I haven't yet investigated. Rated 5 out of 5 by LMC1970 from Great product at a great price Upgraded my Fitbit from the little clip-on version. I like the function that vibrates to get you walking every hour if you haven’t done 250 steps, reminds me to step away from my desk. Arrived quickly, well packaged and much cheaper than anywhere else. I’d definitely shop here again.